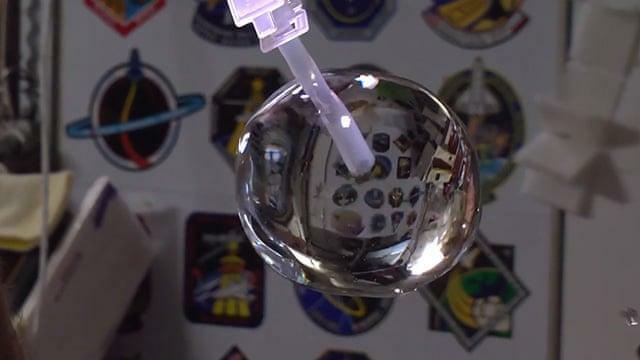 Could a water bubble (spherical occlusion of water in air or vacuum) similar to the one in the picture below remain in Earth orbit without evaporating, dispersing, or disintegrating? Assume the orbit is high enough (high LEO or MEO) so that re-entry is not the limiting factor. Is there a range of sizes that would be suitable; is there a "too small" or "too large" to remain stable? Would it likely remain liquid, or would it freeze? Assuming the water was originally pure and potable, would it eventually become toxic or unsuitable for drinking as a result of being in Earth orbit? If a time limit is necessary for the answer, let's say we'd like it to remain stable, and ideally drinkable, for 100 years. The ball of water in that picture is in orbit; it's just surrounded by (presumably) the ISS. But a ball of water like that definitely cannot survive in the vacuum of space. Below a certain pressure, water can only be water vapor or ice. So a ball like that would immediately start to boil if it were surrounded by a vacuum. The water vapor would quickly disperse and there would be nothing there. It would not become toxic. If it were kept in a container to keep it from evaporating, it would just be water. This is all assuming it's close enough to the sun to remain liquid. Some of the moons in the outer solar system are mostly ice, and at least Enceladus (around Saturn) and Europa (around Jupiter) have large oceans under the ice. Not the answer you're looking for? Browse other questions tagged orbital-mechanics physics water station-keeping or ask your own question. Could a Soyuz land in water? Could it be possible to “steam” up water to orbit and collect it there? Could solar sails be used in station keeping?